This will be part of an ongoing series that explains the various statistics that I will be making available this season – for every player, from every Scottish Premiership club. Here is a link to those stats. As many of you know, Key Passes are the passes that lead to shots. As time goes on, I have put way more value in Key Passes in correlation with Expected Assists than actual assists. For example, Dundee’s Scott Allan is fifth in the league with eight Key Passes for an Expected Assists total of 1.39 (also fifth in the league). Guess how many assists he has? Yup. You guessed it, zero. Does that mean Scott Allan is off to a bad start to the season? Isn’t his primary role to be a playmaker? Couldn’t you argue that he’s actually been one of the best playmakers in the league & he has been hurt by his teammates inability to finish off the chances he’s created? As a team, Dundee has the lowest Scoring Chance Percentage in the league (0.125). That’s bad, really bad. Of the shots on target from Scoring Chances, only 13% have scored. Kilmarnock is the next worst at 20%, then Aberdeen at 36%. James Forrest leads the league with 13 Key Passes & like Allan, has zero assists on the year. His Expected Assists is actually lower than Allan’s at 1.04. Clearly the shots he is creating are coming from lower danger areas. In fact, only 15% of his Key Passes have set up Scoring Chances, while 38% of Allan’s Key Passes have. Earlier today I had what many call a…Moment of Clarity. Tracking who was getting Scoring Chance shots was only telling half the story. What if I went back & began tracking which players were creating those Scoring Chances with their passing? Setting up a shot that comes from outside the box is one thing, but being able to get the ball into the heart of the box (or six yard box) to create a shot from here is a whole different level of passing. It’s early….but here are the leaders in the Scottish Premiership after four matches. Fifteen other players have two Scoring Chance Key Passes including the aforementioned James Forrest, along with Michael O’Halloran, Chris Cadden, & Gary Mackay Steven. No Rangers players have two, so you can see that their most dangerous playmakers have clearly been Lee Wallace & Daniel Candeias. Lee Wallace’s impact has been under appreciated this season by many Rangers supporters. He has five Key Passes this season & 80% of those have set up Scoring Chances. His Expected Goals of 1.12 is second only on the team to Daniel Candeias & the next highest total is Kenny Miller with 0.49. 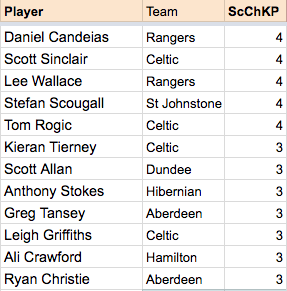 In fact, of Rangers 14 Scoring Chances this season – eight have come from Wallace or Candeias’ Key Passes, while three have been unassisted. 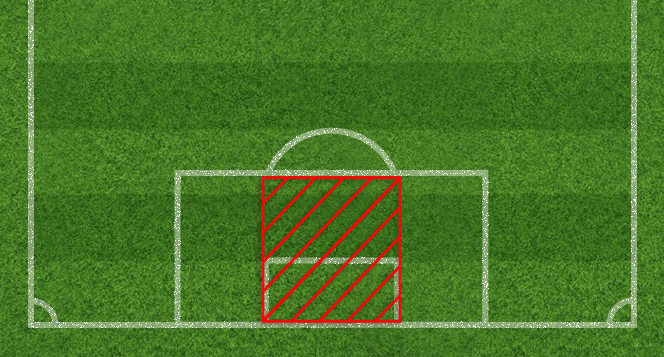 100% of Tom Rogic’s Key Passes have set up Scoring Chances & two of these have led to goals. Scott Sinclair also has two assists on his four Scoring Chance Key Passes. John McGinn has gotten a lot of attention in the past few days as his name has been linked to a move to Nottingham Forest. He is tied for the second most Key Passes in the league with eleven….only one of these Key Passes has set up a Scoring Chance. McGinn is a good player, but you can see how his high Key Passes can actually be misleading considering the lack of quality chances being created from his passing. These stats will be made available for FREE until September 7th. After that a one-time fee of £15 will be required to get access to the data. If circumstances change at any point & if I am unable to finish compiling the stats for the entire season than the money will be reimbursed.